I have answered the most important question in life here. Why the heck middle age is called the middle age? Folks who are still in school; I am not referring to the time period in earth where hairy people rubbed stones to make fire and poked each other with spears instead of facebook. Gee, they did not have facebook at that time; losers. I am talking of the age when your parents can embarrass you by breathing. Here is the answer to the important question. It is called the middle age because whatever you eat it ends up in the middle. Alarmingly your age becomes your waist size. One day in the morning, I woke up and found out that I have stepped in to middle age. I did not realize it till my wife subjected to me a fidelity test which I have always failed till date. She went quiet and I think her cheek was wet with tears. This has never happened before. She can now claim her husband to be completely hers. Only thing is the most of the time her husband is bumbling around the house asking “Who am I”. Not philosophically because it is bloody hard to remember. So in order to bring coolness in to my life, I literally took matter in to my hands. Discerning readers would have noticed that I did not say “to bring coolness back”. It happened during my wife’s annual trip to her in-laws and my in-laws. It is the scene straight out of the movie – Seven year itch. My mind was filled with all the wild things I would do during her absence. I could not remember of even one though. Alas, there was no Marlyn Monroe to seduce me. Hence, I called up the person who comes handy during this time to correct the situation – Russell the Artist. I knew that he was an artist because among other things he had his nose pierced. 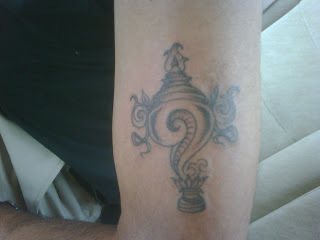 He is no ordinary artist, he makes permanent markings on your body, through mutual consent. I went to a social gathering with a teaser portion peeking out and proudly declared – “I got a tattoo”. One pretty young one approached me. I thought at last I have become super cool but my world came crashing down when she said “Uncle, where is the tattoo”. I bit back by tears, ignored the uncle bit and replied in a husky voice “On my biceps”. She started laughing out loud and said “What biceps”. The dam burst and my Tshirt was wet with tears (Read all about me trying to build biceps in Gym capers, way to stronger teeth). So If you see a middle aged guy with a wet Tshirt, mumbling to himself “who am I”. Show him this picture to remind him about his identity. If you are a lady, give him a hug. Please do ensure that his wife is not around though.